On top of it all, this recipe is incredibly easy to put together. And then how fancy these appear. But it requires no special baking tools or technique. If you can mix wet and dry ingredients together, you can make them. Also no eggs. This sure will make every non egg eater’s heart sing! We start by melting some peanut butter in a bowl. You can do this in a double boiler. Or even in microwave. But be extra careful. You don’t want to burn your Peanut butter. Throw in some honey, nuts, oats, rice Krispies cereal and not much else to your melted peanut butter. Mix everything and press the mix in a baking dish with firm hands. And stick it in your oven. That’s how easy the procedure is. And how do these Granola Bars taste? It’s very much like biting into a soft, chewy, gooey, nutty and very chocolaty bar. Accompanied with slight crunch from rice krispies cereal. You could use brown, white or even gluten free cereal. I used this one. I have added a mix of crushed walnuts, hazelnuts and slivered almonds to my Granola bars. You may pretty much add any nuts you prefer. But I would suggest not to miss out chunky walnuts and almonds. These add so much texture contrast in the bars. Also both walnuts and almonds gel in really well with oats and chocolate. Oh and yeah, honey! I almost forgot to mention it. Your bars are sweetened only with natural sugars. And honey is employed not only to sweeten the bars, but also to bind them as they bake. One thing to be careful about is- take your time to press the mixture compactly in the baking dish. This is a very crucial step to help granola bars hold their shape. Which will in turn prevent the bars from falling off after they bake. We got to cool the bars down completely in the baking dish. Then chill the bars in the refrigerator before cutting them. They need to sit in the fridge for an hour. This is the hardest of all the tasks that I know. Given the bars taste absolutely yummy right from the oven. But they will fall apart if attempted to cut before cooling. Breakfast is fun with these bars around. Chocolatify, nutify oatify and honeyfy (wait…are these even words? Never mind you get my point) and beautify your day with these granola bars! Say hello to your health and guilt free munching with these yumm spelling, soft and chewy Granola Bars. 1. Line a 8 by 5 inch loaf tin with a parchment paper. Keep it hanging from the sides and set aside. It will be easy to take the out after they cool down. Preheat your oven to 300°F(149°C). 2. Melt peanut butter in a double boiler or microwave. 15 seconds should do the trick. Mix in honey, vanilla, salt, walnuts, hazelnuts and 1 tbsp of the chocolate chips. Save the rest to press them for decoration. 3. Also add in 2 tbsp of slivered almonds(slightly crushed with hands) saving the rest to spread for decoration, before baking. 4. Quickly mix in oats and add rice krispies cereal then. Stir everything and press into the lined tin. Take your time and press the mixture down with firm hands. You may press them in with the back of a spatula(applying some butter to it), if you find the mixture a bit to sticky to be handled by hands. 5. Spread and lightly press down the rest of slivered almonds and the remaining chocolate chips. Bake the bars for 15 minutes. 6. Cool the tin down completely ( about 45 minutes). Then keep it in the fridge to cool down further for not less than an hour. If that sounds a lot of time, stick the tin into your freezer for half an hour. You may cut them bars straight away then. 8. Pull out the uncut granola bars lifting the parchment paper the Cut into 8 bars with a sharp knife. You may substitute rice krispies cereal with the same amount of oats to make the bars even more chewier than on the crispy-soft side. Or use brown, white or even gluten free rice krispies cereal. Don't bake them any longer than 15 minutes. The bars stay soft and chewy that way. 16th minute in the oven and they may start to burn at the edges. BONUS: You can try making as less as 4 bars or as many as 20 in one go with my recipe table below. Always eat fresh with my customized to your need recipes. • Oven temperature and instructions are same for all the three recipes of healthy granola snack bars. 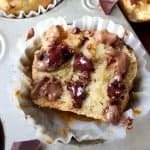 • Make the FAMILY FIRST RECIPE (for 4 Bars) in a 6 by 6 square baking tin. Bake at 300°F(149°C) for 10 minutes. Cool these bars in the freezer for 15 minutes for a quick chill. • For BAKE UP A STORM RECIPE (21 bars), bake in a 15 by 10 inches cookie sheet. The oven temp. is 300°F(149°C) for 22-25 minutes. Keep an eye after 22 minutes. When you are able to smell them, they are done. • Cut the bars only when they are firm, else they will fall apart. • Store your bars in fridge to retain their firmness. Can we substitute peanut butter with normal butter? yes you sure can. Just use very soft butter. Enjoy! I’m a huge sucker for granola bars! I also keep a stash in the pantry, but I totally need to try this recipe out. I love homemade granola, so it’s not a far jump to turn that granola into granola bars! These look delicious! Thanks for visiting. I am sure you won’t be disappointed. A big fan of your granola recipe, love those clusters. Gotta try it too. Whr did I go wrong..I loved them and want to make them again..
Also when I cut these bars initially, some of my bars fell too. Then when my husband tried cutting them, his trick won! .Is it fine if I don’t use rice krispies as in india v don’t get …Will muselies do? Muesli is perfectly fine. Honey at room temperature will work well too as the peanut butter is already heated up and melted! These look amazing, I love making my own with wholesome ingredients like these. Happy feasting!